The years leading up to the autumn of 1979 in Iran proved to be turbulent, resulting in a radical transformation of the nation. The U.S had backed the semi-absolutist monarchy of Mohammad Reza Shah Pahlavi, even when the increasing popularity of Islamic fundamentalism, Iranian Nationalism, and opposition to western influence exploded, culminating in protests against the Shah in 1977. The Shah used increasingly brutal tactics to suppress rebellion; his actions only further inflamed the revolutionary fervor of the populace. Organized armed resistance began in 1977. The Shah fled the country on January 16, 1979, leaving a provisional government in power. Meanwhile, the fundamentalist leader Ruhollah Khomeini, who had lead opposition movements before his exile, returned and resumed leadership over the revolution. Khomeini rallied his forces and disposed of both residual royalist troops and the provisional government that ruled in the Shah’s name, thus formally establishing himself as Supreme Leader of the new Islamic Republic. Rival factions were subverted, and Revolutionary Guards roamed the country to ensure the preservation of the new order. After the Shah left Iran, he became ill with cancer and was granted medical asylum in the United States in the October of 1979 with the reluctant approval of President Jimmy Carter. Many Iranians viewed the Shah as a war criminal and demanded that the U.S hand him over for trial. When the U.S government refused, a group of revolutionary student protestors rallied outside the U.S embassy in Tehran to demand justice. 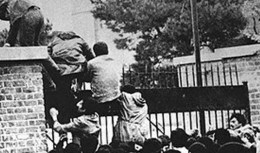 On November 4, 1979, students scaled the walls of the embassy and broke into the compound. 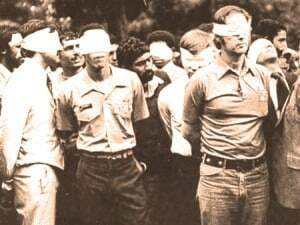 Fifty two U.S diplomatic personal were captured and held hostage for what would become 444 days. The Khomeini regime welcomed the new-found leverage against the U.S. and Khomeini deployed the Revolutionary Guards to round up any American personnel that may have escaped into the city. 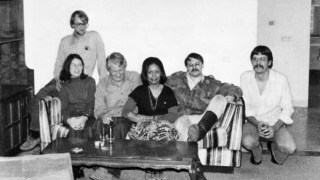 Kathleen Stafford served as a visa clerk in the U.S consulate center within the U.S embassy in Tehran during the revolution. She, along with her husband Joseph Stafford, Robert Anders, Cora Amburn-Lijek, Mark Lijek and Lee Schatz, escaped the initial breech of the embassy. The escapees divided into two groups to avoid attention. Stafford and her group evaded capture by moving from vacant house to vacant house before finding a more lasting refuge at the homes of Canadian Ambassador Ken Taylor and Consul General John Sheardown, who welcomed them despite great personal risk. 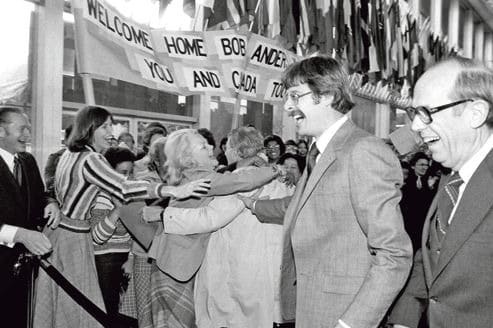 The group would remain guests of the Canadian diplomats for almost three months until a CIA extraction operation lead by Tony Mendez, made famous by the movie Argo, allowed them to escape Iran on January 28, 1980 by posing as a film production team. 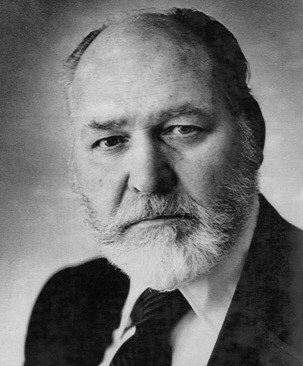 The movie was criticized by Ambassador Taylor, who died in October 2015, and others as discounting the role the Canadians played. Follow the links to learn more about Iran, hostage-taking, close escapes and to read about U.S. hostages held in Iran for 444 days. The State Department’s idea was that all of those people that had been there previously at the time of the Shah might be viewed as tainted. So there was a major turnover and there were lots of new people at the embassy. So Bruce Laingen, the Chargé, and Vic Tomseth, his deputy, and Mike Howland, the Security Officer went over to the Foreign Ministry to complain. One of the things [that made it possible] for all of us to get out safely was that it was supposed to be Ann Swift who accompanied Bruce Laingen to the Foreign Ministry, but she was just a few minutes late. So Bruce took Vic with him and Ann ended up becoming a hostage. 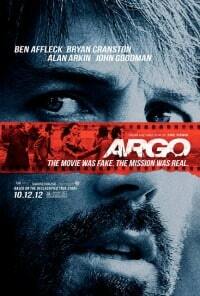 You see her being blindfolded in the movie [Argo] when the militants break through the front office door. Chargé Laingen went over to complain about lack of protection for the embassy and people being allowed to write on our walls and do these things. In addition, the consulate was closed to non-immigrant visa applicants to protest this lack of security, supposedly guaranteed by the Iranian government. Since we were closed, we were all doing administrative work paperwork. I had come in late because I had waited at home for our new housekeeper to come so I could show her what I wanted done at the house. It was to be her first day. She had called and said I could just leave the key and she would come in and do the work. She was the housekeeper for Kate Koob, Public Affairs counselor, and had previously been on the char force at the embassy. She was quite insistent that I just leave the key, but I told her “no,” I wanted to go over the work together. I later began to think she might have been one of the people who were let go when the embassy downsized after February. She might have been there for the takeover of the embassy that very morning and perhaps told the planners about the layout and various things since the invading militants seemed to know right where the weak links were in the security chain and what windows to break in through…She failed to show up, so I went to the embassy to work. And they said “but today is the day of the Martyrs.” They were obviously very nervous. I walked back across the compound and went into the Consulate and straight to Joe’s [seen left] desk. I told him that the ladies in that ID office were not in a very good mood and he should probably go over there with his passport and get his papers processed too. Luckily he didn’t listen and didn’t get around to going over to the chancery building or he would have been in the open or in the chancery building at the time of the takeover and would have been held with the others for the 444 days. But Don Cook from our A-100 class [first training for diplomats] was outside. He was getting us croissants. As soon as he ran in, I shut the door. I remember shutting the door (laughs). And then we waited for things to settle down, and it didn’t look they were going to settle down. More and more people kept coming on to the compound from the little bit we could see. Somebody said, “Go upstairs,” because that would be one level up and quieter. That day, the only people that were in the consulate other than the regular American employees and our local staff were some people applying for some immigrant visas for their relatives or things of that nature. There might have been 15 or 20 non-embassy Iranians something like that. Bob Morefield, the Consul General, our boss, called the police and said “we’re having trouble here. You need to send somebody over.” I think they just hung up on us. So after about an hour or so, the local staff were looking very nervous. They were crying. Some of them took off their ID cards and tossed them behind the file cabinets, because they knew it’d take a long time before anybody found them there. At a certain point, Al Golacinski the RSO, Regional Security Officer came over from the chancery, and he was walking back and forth trying to reason with the militants and figure out what to do with us. I can remember all this sort of pandemonium. In the meantime someone threw something in through the bathroom window. I guess that had not been reinforced. The Marine, Sargeant Lopez, tied the doors of the two restrooms together with a coat hanger to delay anyone trying to get in that way. Then someone thought they smelled smoke coming from the roof, so we thought we should try to leave out the backdoor where the visa applicants always come in. At this point, this was only a takeover by the students/militants and nobody else was in on it. The local revolutionary guards, who were usually posted outside our door and were armed, weren’t in on this takeover. They were just standing there guarding their post. Rich Queen, who was also in the A100 course with Joe and Mark Lijek and Don Cook, went out and said hello to them. They didn’t say much, they said hello. Then we started leaving. First were the Iranians who were there for their immigrant visas, and then the FSN’s and finally the Americans. We were going to split into two groups. Our group was Cora and Mark Lijek, Bob Anders, Joe and I, a young American woman, Kim King and a local employee, a young woman who offered to show us the way to the British Embassy, since we didn’t know its location. And that was our safe haven goal. Our eight went one way and Mr. Moorefield’s group went another. It started raining. That might have helped too, because we had umbrellas out and we would not have been so noticeable. We realized we were not going to make it to the British Embassy. Bob Anders said, “I think I’ll go home; I live close by. Do you want to come with me?” We had been there two months and we knew nobody but a few Iranians who we could not possibly ask for help. We headed over towards his house, and we separated a little bit more to be even less noticeable. There was one roadblock, a Revolutionary Guard headquarters office that we had to walk by; we crossed two at a time. We got to Bob’s house and started listening to the embassy radio. Everybody had a radio in their house. We could hear that the Americans talking and the Iranians militants too. Finally we could hear that they got into safe and to the vault, that is, to the classified area… Finally there were only Farsi speakers on the radio and so we knew that meant everyone at the embassy had been captured. We called the British Embassy to see who had made it there. There was only one local employee who was hysterical. We started calling around to the different places. There was an apartment building where some of the Marines and TDYers stayed. We reached Lillian Johnson who was there. She was supposed to have left that day and there was some complication at the airport with her visa, so she had been brought back and she was in this apartment in a high rise, and she was looking down on the compound. She could see the mob and she could also hear people coming into the building, so she was just trying to stay out of sight. Then we called Kate Koob, the cultural affairs officer who worked at the USIS (United States Information Service) Office at the Iranian American Cultural Center, which had not been attacked in February. Kate was thinking, “We’re not considered part of the embassy by these students so nobody’s going to bother us. So we’re just fine.” So she and her deputy, Bill Roper stayed there, and they opened a line to Washington. The young woman who had been trying to get a visa for her husband wanted to call home. She was afraid that he would lose his temper and go over to the embassy and have trouble, so she was trying to call him (laughs). I think she did reach the family, and when she said she was staying with some Americans, the line died, you know, the phone died. It had been a party line; people in the apartment building were all using it. Someone went upstairs to the neighbor’s apartment and asked if she could use their phone, so I think she was finally able to reach him and he came to pick her up. Then they both came back later and brought us chicken kebab since we didn’t have any food. Later in the evening Kate Koob called the apartment and said, “Can somebody come over? If I send my driver can somebody come over and keep this line open in to Washington?” because back in those days if you lost the line you couldn’t necessarily get it back. When Kate and Bob woke up in the morning they said, “We’re fine now. We can take over again.” Now, all along we’re thinking, you know, this isn’t really going like it did back in February. They’re not freeing our people at the embassy. It wasn’t looking good. So we thought we better get some clothes and some money. Kate loaned us her driver and we went to the Lijeks’ house and they got some money and packed some clothes and we got some food out of the refrigerator. Their landlady was not a very sympathetic type and they wanted to be out of there in a hurry. And we said, “No, thank you very much.” And then some Kurdish friends came over too and asked if they could help and we said, “No, you better throw away our phone number. We’ll get out of this, but you could have problems.” People were really courageous to offer us help at that time. I was able to get through to my mother on the phone. I said, “You’ll hear things on the news and I’m fine and I’ll call you in a couple of days. But then of course I didn’t call her again for 90 days, until I was back in the US. We napped there in the afternoon having had no sleep the night before. Then Vic called to say his friends at the British Embassy would come pick us up and we could stay in their residential compound. Two cars came late in the afternoon and picked us up and went to Bob’s house and took us all to Gholhak Gardens. It felt good to be out of embassy housing since we worried the students would find the rental housing list and come looking for stray Americans. But the next morning we got a call from Vic saying the British Embassy had been attacked the night before and they felt they could not guarantee our safety, so we would have to leave. That’s when Vic had the ingenious thought of calling his cook Sam from Thailand [Somchai “Sam” Sriweawnetr], who was the cook for a number of American embassy employees and so had keys to the houses. Not only could Sam help us hide but he and Vic could speak Thai so no one listening would know about the plans or location. The Brits again gave us a ride, this time to the home of John Graves, who by that point was a hostage. Sam was there to greet us and we slipped in trying to be as inconspicuous as possible. Over the course of the next few days we hid there, keeping out of sight with the lights off. The house was sparsely furnished so we slept under rugs or in our clothes. Sam would shop and cook for us. He learned that the regular housekeeper, also Thai, was worried her boss would return and find his food eaten and wine drunk and be angry with her, so she wanted Sam to get us out. Without telling her where we were going we snuck out and went to Kate Koob’s house. Vic Tomseth had told us that she had been taken hostage too. I remember it as creeping out in the wee hours through neighborhood back yards. But I am not sure if that is just a dream. In any case we left more of our clothes in the washer. We didn’t have many in the first place since we weren’t planning on this being a long term event. By now we were down to almost no clothes and no money. So for those critical early days, thanks to Vic’s quick thinking, and Sam’s loyalty and courage, Sam could secretly help us hide. Within a short time, it was clear that holding the American hostages was earning support for the Khomeini regime, so he was not going to free them. 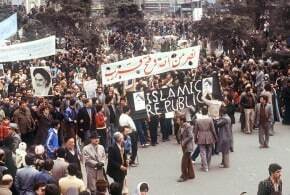 The Secular government resigned and the Revolutionary Islamic Government took over. …Three days after the takeover, the Bazargan government fell. They withdrew, which meant there was no longer a secular head of the government. Then we knew we were in difficulty, because there was nobody for our people to negotiate with, except for Khomeini’s people. I think that was around the third day. We may have been at Kate Koob’s house a day or two later. It had a large picture window with no curtains right on the street so we couldn’t really move between the kitchen and the rest of the house without being seen. We were getting very tense and stressed trying to figure out what to do. People knew that these were the American embassy houses. Everybody knew in the neighborhood. And we thought eventually the militants are going to go to the Admin Office and find the list of housing and they’re going to come looking for Americans. When we called John Sheardown [seen right], he said, “We’ve been worried about you. What took you so long?” He said, “Of course you can come over.” So the Brits then came over to the house and they brought us over to John Sheardown’s house [on November 10, 1979]. I will never forget him standing out on the sidewalk with his hose, washing the sidewalk with his garage door open so that the car could just pull in and nobody in the neighborhood would see us get out. I wear these scarves and Mark had blonde hair, so I think he was wearing one of my scarves to hide his hair so that people looking in the car wouldn’t recognize [him as an American.] So they closed the garage and we go in to the house and we’re sitting with the Sheardowns. At this point we’re sort of nervous, hope this is really it and we get to stay here, because we felt safe in an official residence, another diplomat’s home. I think it was Mark who said, “Does your Ambassador know about this?” and John Sheardown said, “There he is.” Here’s this fellow that had driven up in this little two-seater sport scar and he had on jeans and he had curly hair. And we thought he was a junior officer. And so that’s [Canadian] Ambassador Taylor. [In late January ] we knew something was changing because the Canadians started leaving. But, before that happened, they had started bringing people in and out, randomly. The Canadian Royal Mounted Police, their equivalent of the Marines, would start coming through so that the airport immigration people would get used to seeing Canadians coming and going. And they would also observe everything about how the airport worked. They also were thinking about the best time for us to leave. So that’s why we left so early in the morning, because they thought, it’s the end of the shift, people are tired, they’re not going to worry about yellow and white pieces of paper matching or things like that. .. and there were not that many Revolutionary Guards around that time of the day. Eventually Pat left and then we were going over to the Sheardowns house. I don’t think they ever spelled out how. We went over and stayed at the Sheardowns. And that’s when Tony Mendez, alias Kevin Harkin, and “Julio” came to give us a choice of which of these three scenarios we were going to leave with. We had the: going out as nutritionists, something we knew nothing about; oil company people, even less; or going out with this movie production company, which had all the props, concrete things that made it believable – business cards, the magazine with an advertisement for our movie site search. Of course I felt comfortable with the movie production company, because I was the graphic artist. If somebody asked me to draw something, I could draw it. And Cora was the writer, the screenwriter, I think. Joe was a producer. He looks good in a turtleneck, so that was the logical choice. There was not that much to memorize, what our names were and where we were born and how to say this and that in a Canadian accent and things of that nature. We knew so little about Canada. We tossed everything we had from the USA, everything we owned that had any sort of American brand on it. And all the people from the Canadian Embassy gave us their clothes. I had this suitcase full of sandals in wintertime in the snow. I had been wearing my one pair of pants and I had Ken Taylor’s shirt, because his wife was a diminutive Chinese Canadian lady. They gave me some more clothes to put in my suitcase. For my disguise I just took all the long hair and put it up and they gave me fake glasses. I still have them. All I had to do was pull my hair back and put on some glasses because people only recognize me because of my hair and my height. I didn’t feel very recognizable. At one point the [the Iranians] did send two guards to stand outside the Canadian Ambassador’s house to watch who came and went. Guna Siland said, “If I don’t give them any tea, they won’t be here tomorrow,” and they weren’t, so he was right! Something we didn’t know at the time was that Charge Laingen had told someone in the Foreign Ministry that the Canadians were sheltering some of us in hopes that they would help us. They just kept quiet. They were interviewed recently and confirmed that they knew about us but figured exposing us would just lead to more trouble, so they kept that information to themselves. That is what they say now, but I think they were protecting us too. 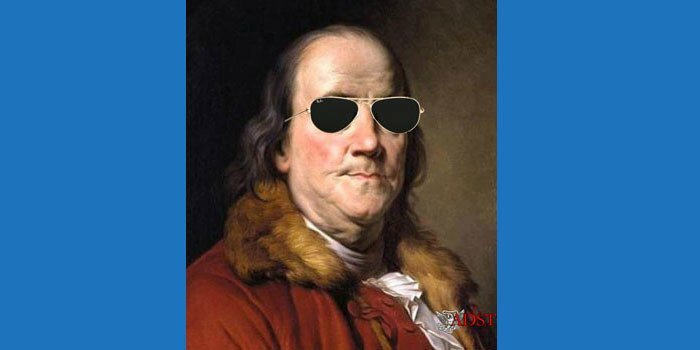 As professional diplomats they understood and respected international treaties and the militants did not. The other thing that happened that we didn’t know about until we read the books was that the [entry] dates were wrong in our visas. 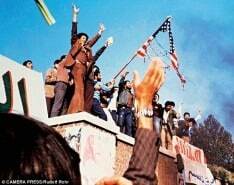 The CIA had not used the new Iranian calendar. They had used the previous one from the days of the Shah, so if we had been caught with those we would have been in big trouble. But Roger Lucy, the young Canadian officer, saw them. We did not see any of these items until those last two days. I don’t know if we would have caught the errors or not. Joe probably would have with his attention to detail. We might have been so happy to have our getaway stuff that we wouldn’t have even checked. Tony (seen at left) requested another set of passports and, being a master forger, he “corrected” the dates using Ambassador Taylor’s good scotch to moisten his ink pad. In fact that is the moment the CIA chose to memorialize Tony’s incredible contribution to the CIA. [At the airport] For a moment they stopped Lee Schatz and asked why his mustache didn’t match his photo, and he made some gesture so they let him through and then we did line up to board the flight and were told there would be a delay. That was worrying and we hoped it had nothing to do with us, and we didn’t want to still be hanging around in the airport when the Revolutionary Guard shift came in. Tony said to sit tight, he went to check with our New Zealander contact and found that it would be a minor delay, so we figured it would look suspicious to try to change flights and send our luggage one way and us another. So we waited and finally boarded the plane…. [The Canadian embassy then shut down.] I think they had already started. The only people that remained after us were the head of their security, Claude Gautier (Sledge) along with Ken Taylor (seen at right). I think they left the same afternoon of the day that we left. Everyone else had already been sent out, thank goodness, because you know, if it had gone wrong, they would have all been in jail with us. If we were lucky enough to be in jail I suppose. We arrived in Switzerland and traded in our Canadian passports for our very own U.S. diplomatic passports, and went to stay in the American Ambassador’s residence. It was beautiful and felt so very great to be out and safe from harm. There we met Sheldon Krys, a dear and familiar face, and he had a State Department doctor with him in case we needed any medication or care. The next day, as promised, Jean Pelletier broke the story as soon as Ambassador Taylor and Claude got to Paris. The State Department had planned to have us hide in Florida until the Hostage Crisis ended, never dreaming it would be another year of course before they could obtain the release of the others. But then the secret was out. We had to go undercover again, trying not to antagonize the Iranians and have a chance somewhere to collect our thoughts so we headed to Rhein – Main. 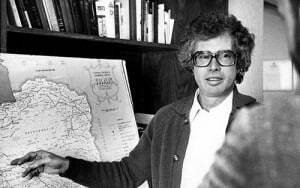 I remember it being dark in our little van as we were driving on the highway with the radio on and they said the escaped hostages are just crossing into Germany, as if the press had a GPS system on the car or something. We were left with our mouths open! The sad part for the other families was that no one knew who had escaped. They all hoped it was their hostage who was free. It had to be such a letdown for them. We were driving to Germany to go to the Rhein -Main American Air Base, where we stayed a couple of days. The Base graciously opened the commissary for us, Sheldon gave us some wardrobe money and I bought the only dress in my size with matching shoes. Thank heavens! My own clothes. Then we flew back to the States to Dover Air Base in Delaware in the official plane of the Commander of US Air Forces Europe. End of tour.